Recent items is a list of the files that you have used or opened recently. These items are displayed as "Recent files" in Quick access, and under "Recent" in jump lists on the Start menu and taskbar. Frequent places is a list of folders, websites, etc... that you have opened recently. 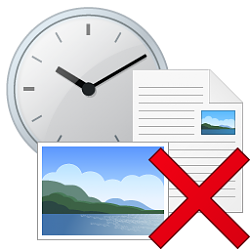 These items are displayed as "Frequent folders" in Quick access, "Frequent places" under File in File Explorer, and under "Frequent" in jump lists on the Start menu and taskbar. When you reset and clear recent items and frequent places, it will clear all non default items including any locations you pinned to jump lists and pinned to quick access. Your recent items and frequent places are stored in the folder locations below. These are the locations that get cleared when you reset. This tutorial will show you how to completely reset and clear all recent items and frequent places in File Explorer, Quick access, jump lists, Start menu, and taskbar for your account in Windows 10. 1. Click/tap on the Download button below to download the .bat file below. 3. Unblock the .bat file. 4. Double click/tap on the .bat file to run it. 5. You will now notice a command prompt quickly open and close, and then your desktop quickly flash as explorer is restarted. 1. Toggle to turn off and on recent items and frequent places. Clearing File Explorer history deletes the info Windows saved about the files and folders you use as well as what you've typed in the address bar. If you clear your history, the Recent files section will disappear from Quick access until you open a file, and all Frequent folders will disappear from Quick access except those you pinned until you open a folder. Thanks a lot for the bat file fix that sorted this many year problem out!! It also fixed my W10 search feature which has never worked before so thx for that too. My hate of W10 has reduced substantialy! Thanks a lot, for one more great tutorial, Shawn. I used the .bat file for a while, but I was not happy with the Quick Access behavior, as it was clearing all frequent folders, including the ones I had pinned, as I use them regularly (my scripts folder, being an example). So I put some time, to find how to do it and came up with an alternative to your batch file, in PowerShell. The following script, does exactly what your batch file does, with the addition that it doesn't clear the "f01b4d95cf55d32a.automaticDestinations-ms", to preserve the Quick Access folders. Unfortunately that keeps besides the pinned ones, the unpinned folders too. So the script then clears all unpinned (not needed) folders from Quick Access. As always, you or any other member of TenForums can modify and use it, according to his/her needs.